The major causes of dark underarms are pollution, poor hygiene, sweating and chemical reactions from antiperspirants and perfumes. Well ladies, you don't have to worry anymore because those causes mentioned above can be prevented and treated easily with soft-7 whitening Armpit Cream and Soap. Armpit whitening set comes with two items which are cream and soap. Please refer below for product description. 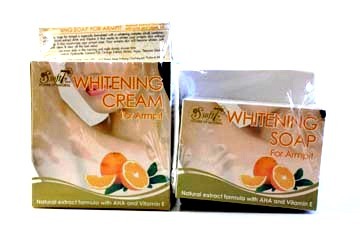 Whitening Soap for Armpit is Whitening Cream for Armpit is especially formulated with a whitening complex. All natural, AHA Alpha Hydroxy Acid and Vitamin E that works to whiten your armpit skin without bleaching. It also moisturizes the skin providing a non-greasy, smooth and natural feeling. 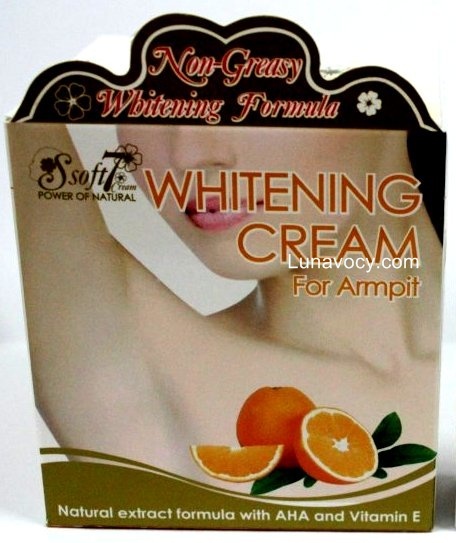 Your armpits skin will look and feel healthy white and refreshed with new vitality. After shower with SOFT-7 ARMPIT WHITENING SOAP, apply cream to armpit areas and use twice daily in the morning and night. Cetyl alcohol, stearyl alcohol, deionized water, isopropyl myristate titanium dioxide, aluminium sulfate, glycerine, glycolic acid, dmdm hydantoin propylparaben, methylparaben, propylene glycol, fragrance, steartrimonium methosulfate, peg-150/decylalcohol/smdi copolymer. Specially formulated with a whitening complex which combines all the natural extract AHA and Vitamin E that works to whiten your armpits skin without bleaching. It also moisturizes your armpit area. Your armpits skin will become whiten, soft and smooth clean & clear all the bad odor. Use twice daily in the morning and night during shower time. After shower, apply SOFT-7 WHITENING ARMPIT CREAM to armpit areas and use twice daily in the morning and night. Sodium hydroxide, coconut oil, orange extract, honey, aqua, titanium dioxide, fragrance. Whitening cream dan sabun ini khusus dirancang dengan kompleks pemutih yang semuanya terbuat dari bahan alami, AHA dan Vitamin E yang bekerja untuk memutihkan bagian armpit. Cream ini mengurangi tampilan bayangan gelap di sekitar daerah kulit sensitif anda tanpa bahan/proses bleaching. Cream ini juga melembabkan kulit, menghilangkan minyak, menghaluskan kulit dengan formula alaminya.